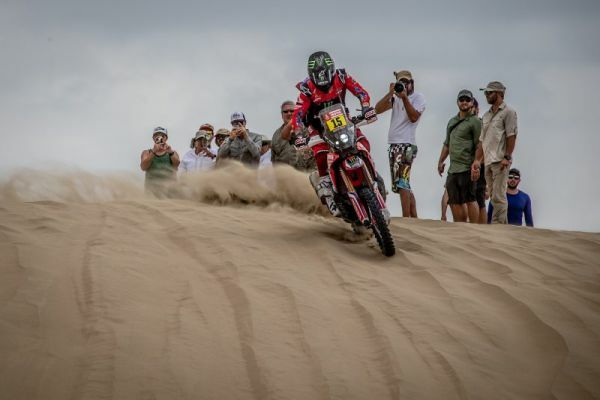 The beginning of the Dakar has been difficult for Xavier de Soultrait and Paulo Gonçalves. Far from the front during the first stage, the two men are already more than 7 minutes behind the leader after 150 km. In his defence, the Portuguese rider has been suffering with an injured spleed for the last month. Ricky Brabec is still in the lead on the second stage and has even opened up some breathing space over Matthias Walkner who he now leads by 26 seconds. As for Joan Barreda, he is now within 2’48 of his team-mate, though Kevin Benavides and Adrien Van Beveren are losing ground. Ricky Brabec and Matthias Walkner are maintaining a devilish pace on the second stage. The two men are only one second apart after 100 km, whilst Kevin Benavides is struggling to follow the tempo and already trails by almost 3 minutes! For only his second Dakar, Harry Hunt is enjoying an exemplary beginning to the rally. Returning to the rally in his high-performance Peugeot 3008 DKR Maxi after a 10th placed finish in 2016, the Englishman finished 9th yesterday before grabbing a fine 7th place today in San Juan de Marcona. Stéphane Peterhansel has also finished the day’s stage. The Frenchman’s long halt in the first zone of dunes has proved to be costly as he finishes 15 minutes behind the stage winner. Nasser Al-Attiyah also had a day to forget, completing the special in provisional 11th place, 7’37’’ behind the victor.